Last year, Hasbro unveiled Scrabble Flash, an electronic version of the popular word game which consists of five SmartLink letter tiles that can communicate with one another using near field communication (NFC) to spell and score words. It's an interesting (and fun) way to build your Scrabble vocabulary for words ranging from two to five letters, but that's about it. Scrabble Flash is still a great way to curb your Scrabble craving when you can't play with anyone else, or just don't feel like firing up your computer or mobile device. But the boring black letters on the LCD screen keep it from being something more... something like Sifteo Cubes. Sifteo Cubes is a new gaming platform that far exceeds the realms of Scrabble Flash. They are small electronic blocks that you move around and touch together to spell out words, just like in Scrabble Flash, only it's not limited to word games. You can solve puzzles or create patterns and even play a shape matching game similar to Tetris. The cubes themselves have LCD screens with 128x128 full color resolution, and though they don't incorporate touchscreens that mobile users are currently addicted to, they can work as clickable buttons when pushed. The cubes use NFC sensors to interact with each other and three-axis accelerometers to sense any tilted movements you make. But in order to actually play games, which right now equals nine, you need to use a USB dongle that plugs into your computer and interacts with the free Siftrunner app, which starts and stops the games. You can play up to twenty feet away from the computer, but all of the sound comes from the computer's speaker, which means you don't want to stray too far. 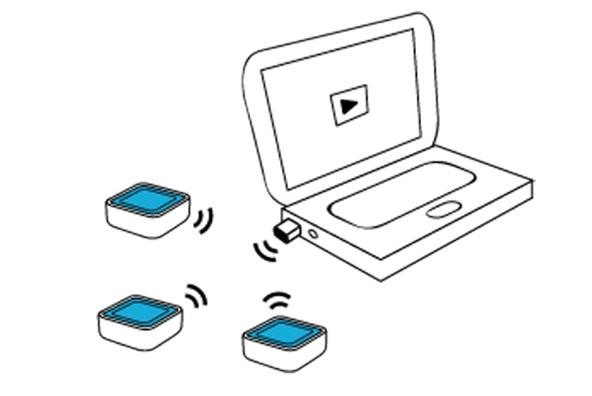 In order to conserve energy, the blocks use a unique wireless protocol that's short range and doesn't require much power. In September, Sifteo will be releasing an SDK for developers to create games, so there is sure to be more than just nine high quality games in their store (for about $5 each). But you don't have to rely on professional programmers to make games for you. 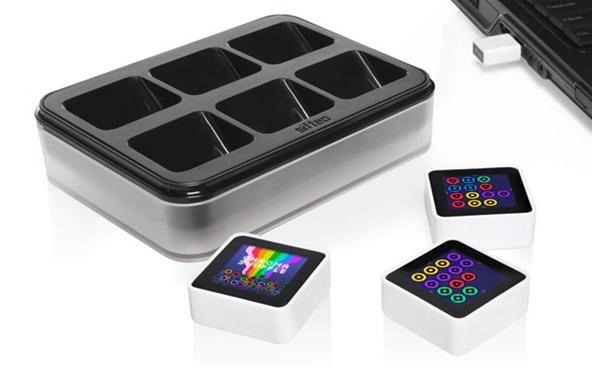 Sifteo Cubes come with a Creativity Kit, which gives users limitless options for creating their own games, like add word lists, build quizzes and issue creative challenges to your friends. Right now, Sifteo Cubes aren't available for immediate purchase, but you can pre-order them from Sifteo's website. A set includes three cubes, charging cradle, power adapter and USB wireless link for $149. They also sell additional cubes for $45 each, though they state you can only use six total at one time, despite an earlier video from TED Talks in 2009 that showed at least nine being used when they were called Siftables. Right now, the best game looks like Word Play... this is "Scrabble World" after all, so of course the word game is going to be the highlight. But in order for it to be challenging at all, you'd need to opt for six blocks instead of the standard three, unless you want to limit yourself to three-letter words only. Otherwise, you should just stick with Scrabble Flash. Especially if you don't want to fork out a whopping $284 dollars for six cubes when you can pay $30 for five less attractive, but just as useful Scrabble ones. These would make for a very fun side project. I'd probably try and figure out a way to integrate them with my keg-orator to track the progress of my home brews.